The first pattern Great Eastern Cutlery ever made was a hefty 4 1/2 large or jumbo trapper known as a pioneer. They kicked things off with two bone handled versions & followed that up with a few other handle varieties. 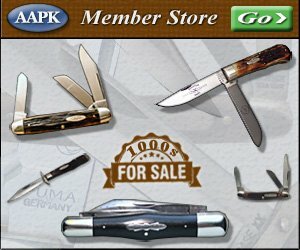 Note that GEC never shipped knives in 2006. The 2006 stamped knives were not actually released & shipped until 2007. The knife designs & many of the components were created in 2006, so they will get categorized as 2006 knives in most places where you will run across them. 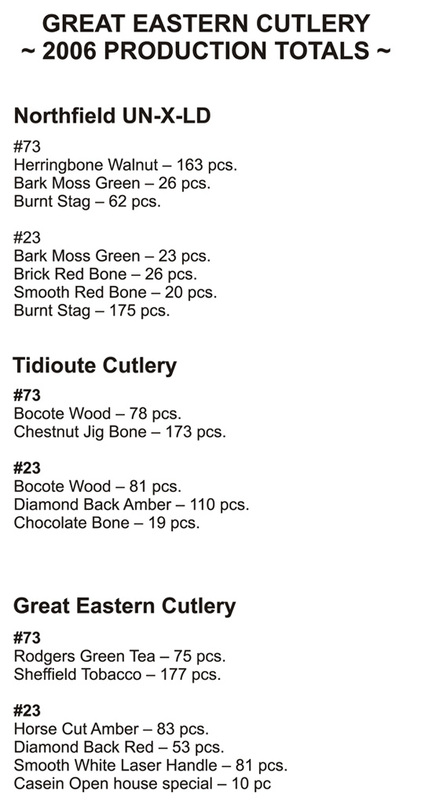 Below, you can view specifications of the first two knives along with production totals for all knives GEC started making in 2006; its first year. Note that the 73 pattern scout knife will also be found with 2006 tang stamps. This knife is essentially a smaller version of the 23 Pioneer. They were introduced & started shipping shortly after the 23 pattern was released. Be sure to stop by our store when you’re done here & shop for Great Eastern Cutlery brand pocket knives to add some great examples from one of the best factory knife manufacturers in the world today. 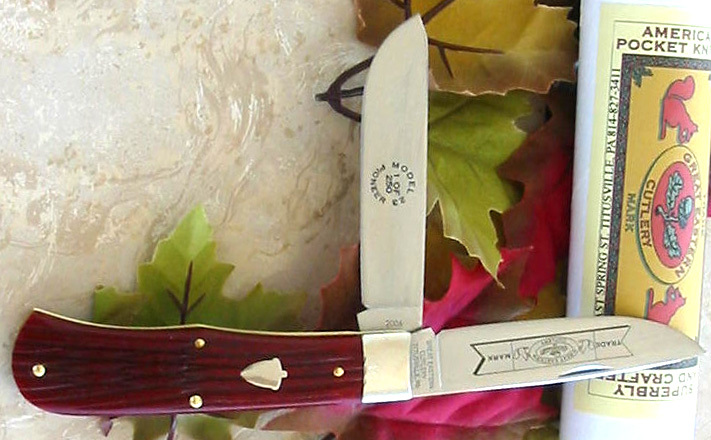 The Red Diamond Back Jigged bone 4 1/2″ trapper was one of the first of two knives to come out of GEC. The first prototypes were made from this bone and from the Amber Horse Cut Jigged bone. The Jigged bone was done in house. These knives are made with 440C steel blades and are tang stamped “GREAT EASTERN” over “CUTLERY” over “TITUSVILLE, PA” on the mark side of the master blade and “CYCLOPS” over “STEEL WORKS” on the reverse side of the master blade. Master blade is also etched with a banner with the Great eastern trade mark. The secondary blade is stamped “2006″ on the mark side and “GREAT EASTERN” over “CUTLERY” over “TITUSVILLE, PA” on the reverse side. The secondary is etched with Model 23 Pioneer – 1 of 250. There are 53 in existence. 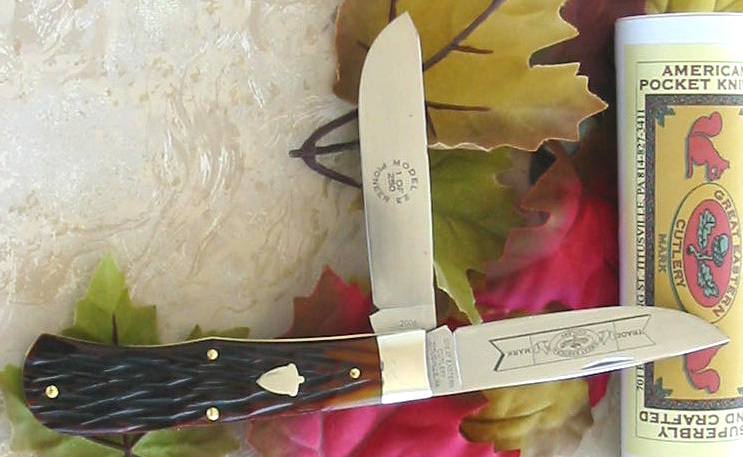 The Amber Horse Cut Jigged bone 4 1/2″ trapper was one of the first of two knives to come out of GEC. The first prototypes were made from this bone and from the Red Diamond Back Jigged bone. The Jigged bone was done in house. These knives are made with 440C steel blades and are tang stamped “GREAT EASTERN” over “CUTLERY” over “TITUSVILLE, PA” on the mark side of the master blade and “CYCLOPS” over “STEEL WORKS” on the reverse side of the master blade. Master blade is also etched with a banner with the Great eastern trade mark. The secondary blade is stamped “2006″ on the mark side and “GREAT EASTERN” over “CUTLERY” over “TITUSVILLE, PA” on the reverse side. The secondary is etched with Model 23 Pioneer – 1 of 250. There are 83 in existance. Total production totals for GEC knives stamped 2006 can be viewed below. There are very few known full sets that include all 2006 knives. The #23 Casien open house knife was only made in a quantity of ten & is the hardest to find / most valuable of the bunch.